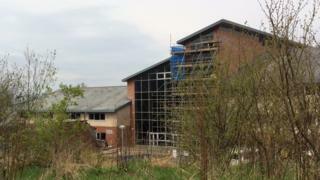 Balfron High School in Stirlingshire has been partially closed due to structural problems. A total of 440 pupils will not be attending the school in the coming week as a result. During precautionary checks, issues with walls in the stairwell, gym and atrium were discovered. The school was built under a private finance initiative about 15 years ago but not by the firm involved with recent problems with Edinburgh schools. A wall at the school was damaged during winter storms but no-one was injured. The new problems were discovered during recent checks by engineers. The buildings will be shut for S1 to S3 pupils until next Friday. Exams for S4, S5 and S6 pupils will still be held away from the affected areas. Alternative arrangements are being made to teach them elsewhere after that. The leisure centre at the school has also been closed this weekend. All swimming and gymnastic classes have been cancelled. Further surveys of the school are being carried out. Stirling Council said it was looking for alternative provision off campus for pupils in S1-3 from Friday and was also planning for alternative on-site provision at Balfron. A council spokeswoman said: Work is progressing at Balfron High School to organise a repair programme for areas of the school that were identified with issues during precautionary building checks. "Senior pupils due to sit their SQA exams remain our priority and these will continue to run in areas of the school that are unaffected. "We are currently planning alternative provision for pupils in S1-3 from this Friday (13 May). "This will initially be off campus and we are working closely with senior colleagues in other schools to identify the best location to meet the needs of our young people." She added: "This will be a temporary arrangement as we are also developing plans for alternative on-site provision at Balfron. "A further update will be provided once more information is available. Every effort is being made to minimise disruption and ensure the best possible provision for all our pupils." The school has apologised for the disruption and said it would keep parents updated on possible alternative teaching arrangements. A letter to parents from school head Elaine Bannatyne said: "Pupils sitting SQA exams are our priority. I understand that this situation may cause additional concern to pupils. "We are doing everything we can to minimise disruption to them."